Mrs Makasiale said Malcolm took a part of them that no one would replace. Sereana Makasiale is still coming to terms with the fact that she will never see her son Malcolm again. However, she will always cherish memories of her son and how “Malcolm made our life lively”. 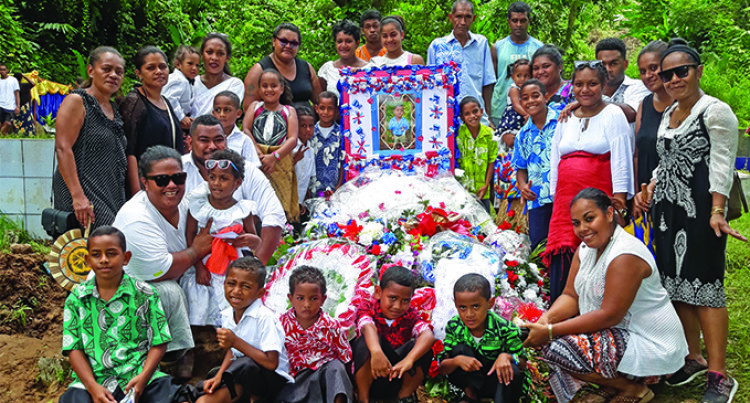 “We will always miss him,” a tearful Mrs Makasiale said yesterday as her son was buried at Lovonilase Cemetery in Suva after a moving and emotional church service at the Qauia Methodist Church in Lami. “I will always miss my handsome son. We didn’t even get to live with him for six years. He would have turned six years in May,” she said. “He was someone who would always does what we told him. He was a good child. “He was very talkative. He was someone who would always be asking questions. He was a child who had a good heart. If he had something and people asked for it, he would give it. “My son was always looking forward to going to school. Even before school started, he was telling everyone that he attended Marist Brothers Primary School. When I went with him for orientation at the school, he told me that I should watch him play at the school ground. Mrs Makasiale spoke of the fateful morning the family last saw Malcolm as he left for school. “Malcolm kissed all of us before he went to school that morning. He told me to wait for him,” she said. “He kept saying goodbye to us and it was something new to me. That morning he was very happy to go to school. Malcolm died last Monday after he was allegedly hit by a bus at about 7.30am at Suva Street, Toorak. The Year 1 student of Suva’s Marist Brothers Primary School was originally from Tubou Village in Lakeba, Lau, with maternal links to Mavana Village in Vanuabalavu, Lau. Malcolm was the eldest of three siblings.